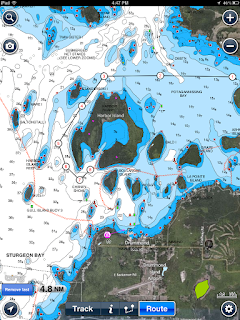 Can chart plotting and navigation on the iPad replace more traditional marine electronics? I've been using a combination of electronic devices for navigation over the last couple of seasons and thought now would be a good time to review one of my favorites, Navionics HD for iOS on the iPad 2. For reviews of another great mobile chartplotter app, see my review of MotionX GPS. I have traditionally used a Garmin GPSMap 76cs Plus handheld plotting GPS and more recently added a netbook computer running the free OpenCPN chartplotter software tethered to the Garmin. You can see this system in action here. More recently, I've put the Garmin in a back-up role and begun using the Navionics HD app for iOS on my iPad 2, along with a suite of other great navigation and sailing apps. Let's get some iPad basics out the way first. The iPad's size, touchscreen and brilliant display are excellent for looking at charts. However, the screen can be difficult to view in direct sunlight and obviously the device isn't suitable for a damp, wet environment. Having said that, you can purchase all-weather protection for your iPad such as dry bags and there are also temporary mounts available. The bottom line is that if your cockpit isn't dry and shaded, you may be better off keeping the iPad down below at the nav station. Now on to the review of Navionics for iOS. The first thing you'll notice about Navionics is the beautiful hi-definition charts. If you're someone who prefers the look of raster charts (basically a full-color digital image of NOAA's paper charts), then you'll immediately notice the different look of Navionics' custom chart renderings. Water and hydrographic features display in bright white and several shades of blue, complete with depth contour lines. You have four choices for land display: "No overlay", "Google", "Bing", or "Terrain". The "No overlay" choice displays land in a raster-like yellow, while Google and Bing both use highly detailed aerial photography. Terrain gives a topographical look with greens, browns and yellows. The only other display choice you have is toggling the "Community Layer" on and off. The community layer allows users to edit map objects, including adding photos of particular features and waypoints right from the camera on your iOS device. This is very handy if you want to capture the look of a harbor entrance or an important landmark. From the main charting screen you have the option of tracking your course, measuring the distance between two points, or creating a route. The tracking feature basically just lays down a yellow line where you've been and records your average speed. Distance measuring is useful for route planning. Route creation consists of marking waypoints along your route. You won't have any real route guidance once you begin cruising on a route like you would with other more traditional chart plotters. This may or may not be an issue, depending on whether you simply like to follow the route line on the chart or if you prefer directional cues and steering/heading information from your plotter. While underway, your boat speed is displayed onscreen. The remaining onscreen functions include zoom in and out, taking a photo for the community layer, a search function, and a centering button which when touched puts your current position in the center of the screen. From the search screen you can search latitude/longitude, marinas, repair facilities, tides, currents, lakes, waterfront restaurants, boat dealers, and marine stores. You'll need to download charts for the areas you plan to visit, but downloaded data stays local on your device memory so you do not need a connection to view charts you've previously downloaded. Keep in mind that while Navionics is compatible with many iOS devices (iPhone 3G, 3GS, 4G, 4GS, iPad, iPad 2), performance varies. For example, iPads with WiFi only will require a WiFi signal/hotspot to determine your location. iPads with WiFi + 3G have a built-in GPS receiver which Navionics uses in addition to cellular towers and WiFi signals, if available. If you don't have an iPad with 3G and the internal GPS, Navionics may only be practical for planning while in port when you have a WiFi signal. Depending on which area of chart coverage you need, the Navionics apps start at about $34.95 and go up from there. iPhone versions are considerably cheaper, but you lose a lot of screen real estate for plotting. While these are expensive prices for apps, they are still a bargain compared to the cost of traditional plotters and electronic charts. Bottom line: Navionics HD makes a very nice second chart plotter for your boat if you already have an iPad or iPhone. You'll need to weatherproof your iPad and come up with a secure mounting solution if this will be your primary navigation tool. Keeping a handheld GPS or other back-up and paper charts is always a good idea. Ready to convert your nav system with an iPad? You can grab a good deal on iPads and weatherproof cases from Amazon. For those of us Android junkies, they recently added the Motorola Xoom to their supported units. Good to know, thanks Deb. Thanks for the review! My boyfriend and I are heading out on our cruise in April, and we've been wondering about the best navigation tools. This seems like best combination of price and functionality. Well said...price and functionality. To that I'd also add good design and UI. @Deb - Glad to see Navionics has added Android support. This can only improve their products. @Bettie del Mar - Just be sure to also bring a back-up GPS and charts! Thanks for the review!! This has been very helpful. Is it an annual fee for chart sets or a one time fee? One time fee. Fairly affordable too (~$35 for my Great Lakes charts). Navionics also has a few in app purchases available that let you get even more out of your app. There is an auto routing add on that creates routes for you between point a and b taking into consideration your boat draft, cruising speed, and gas consumption. There is also an option to get a live sonar feed from your transducer and the chart updates real time behind you (called SonarCharts Live). You I can use a Vexilar Tbox with any mobile device to harness these features. Really amazing technology. 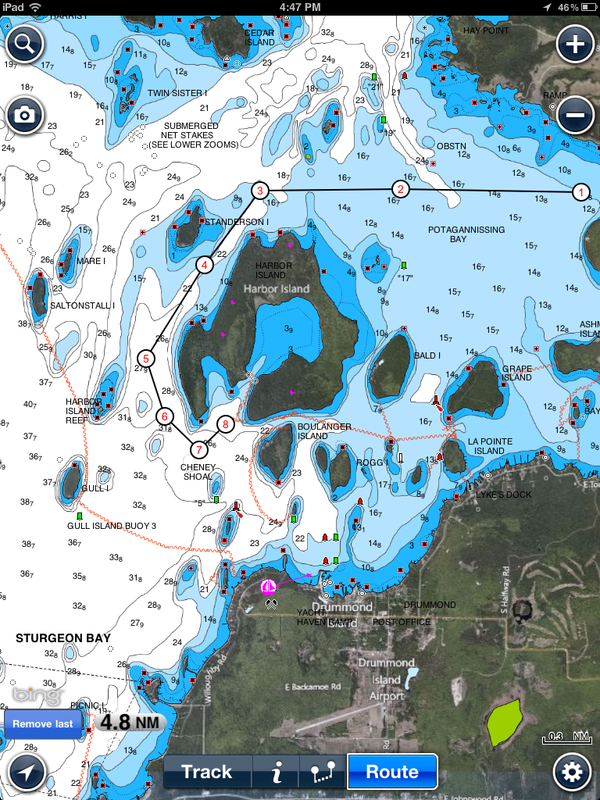 We love our Navionics app and SonarCharts Live feature. The Dock-to-Dock autorouting feature is especially cool. I use it as an easy way to identify a route from start to stop without having to pick my way through the map. It's like Google navigate but on the water and it takes your draft into consideration. Very helpful! !